The value of design seismic base shear increases with increasing values of the importance factor, which range from 1.0 for Risk Category I and II structures to a maximum value of 1.5 for Risk Category IV structures. (See Table 1.) The importance factor is equal to 1.25 for Risk Category III structures. Requirements for drift control are also linked to building risk category. Reduced values of permissible drift are associated with higher risk category structures. For example, allowable story drifts range from a maximum of 2.5% of the story height for Risk Category I or II structures to a minimum of 1.0% of the story height for Risk Category IV structures. More stringent drift requirements for higher risk category structures are expected to limit structural and non-structural damage associated with building deformation relative to lower risk category structures. 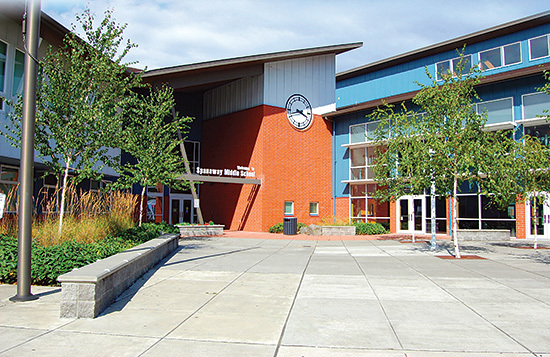 All except the tallest wood-frame shear wall buildings will be classified as short-period buildings due to the stiffness inherent in wood-frame shear wall structures coupled with the ASCE 7 maximum structural height of 65 ft for wood-frame construction. Within ASCE 7, the applicable equation for determining the approximate fundamental period, Ta, for a wood-frame building is shown in Equation 2. From Equation 2, values of approximate fundamental period are observed to vary by structural height. 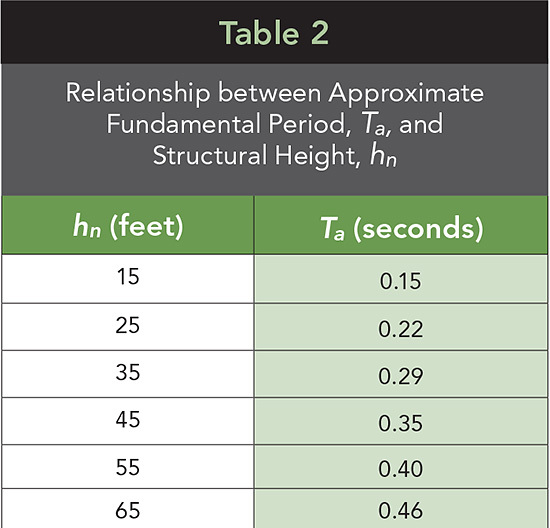 The relationship between height and approximate fundamental period is shown in Table 2. An alternative simplified version of the ELF procedure is provided in ASCE 7-10 for Risk Category I or II buildings three stories or less in height, including building configuration limits to avoid a significant torsional response. The simplified procedure is not applicable in Site Class E or F (e.g., soft clay soils, peats and/or highly organic clays, very high plasticity clays, and very thick soft/medium stiff clays). The design base shear is roughly equivalent to that derived from the full ELF procedure for one-story structures, but results in a slightly more conservative first-story design base shear in multi-story structures. Features of the simplified procedure are: 1) a simplified story shear distribution assumption—e.g., story shear is taken as proportional to the effective seismic weight at each level, 2) omission of requirements to check story drift, and 3) use of seismic R-factors associated with the full ELF procedure.